I hereby warrant that I am a legal competent adult and a parent or legally appointed guardian of the minor child named above, and that I have every right to contract for the minor child in the above regard. 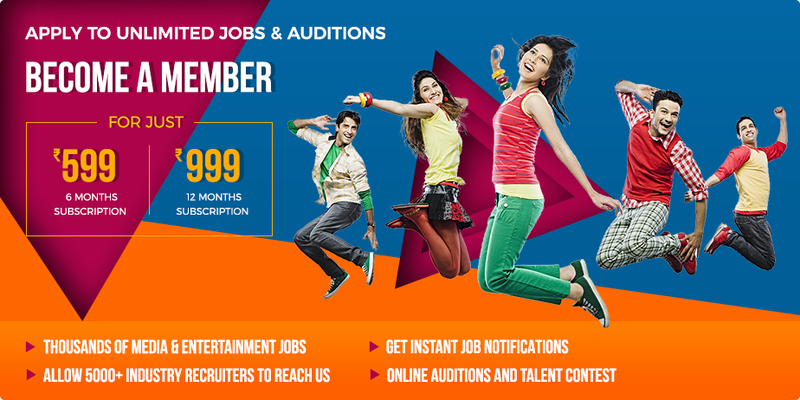 You can apply for unlimited jobs/auditions by top recruiters at no extra cost. There are 5000+ live jobs/auditions/projects currently on talentrack. You do not have to pay any commission for the projects you get placed on by applying on talentrack. You can create a portfolio on talentrack and share it online. You will never have to email photos/videos separately. You can also audition online from the comfort of your home without having to go to studios or casting agents for opportunities in Films, TV and Digital Content. What are my chances to get placed? Apply for as many jobs/auditions/projects as you find relevant to your profile. Which are the top brands hiring on talentrack? talentrack has opportunities from all leading industry recruiters. Artists regularly get projects for brands such as Star TV, Yashraj Films, Balaji, MTV, Zoom, Radio Mirchi, Shashi Sumeet Productions, The Timeliners, Alibaba Group, Essel Vision Productions, Endemol Shine India etc. There are over 4,000 recruiters which regularly hire artists from the talentrack platform. talentrack has also been associated as a talent partner for shows such as The Voice, Dil Hai Hindustani, Femina Miss India, India's Next Superstars and Dance India Dance. Where are you available for work? We have sent you a One-Time-Password. Please enter here to verify your mobile number. please drag the selection to reposition before hitting crop and submit.